For many homeowners, gutters are not something they think about—until there is an issue. When rain is pouring out over the gutter during a storm or a downspout is allowing water to pool near the foundation, we know the gutters need attention. Replacing gutters, downspouts, soffit and fascia is an integral part of McCann’s services to help you beautify and enhance the value of your home. Our experience has made us experts on what you need to know about new Gutters. When Should I Consider New Gutters? What Brand and Style of Gutters Does McCann Offer? Does McCann Offer a Financing Program? Does McCann Offer a Free Consultation? How do I Hire McCann? You notice problems with your home’s foundation. Your gutters are sagging and pulling away from your home. You see leaks at the joints. Your gutters are stained, rusting, or cracked. You notice leaks or mold in your basement. Gutters that are cracked, sagging, or pulling away from your house need attention. They can make your home look run down and cannot do their job of carrying rainwater away from the house. This could lead to damage to your foundation or leaks and mold in the basement. 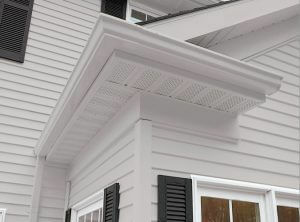 We typically install a 5-inch, 32-gauge gutter style, which is standard. We can also use a 6-inch gutter if desired. For downspouts, we use a wider 3-inch x 4-inch product for its ability to capture more water. The wider format makes it less likely that the gutters will back up and helps ensure that the water is diverted away from the foundation. To keep debris from building up in your new gutters and to minimize the need for cleaning, we highly recommend a gutter guard. Our go-to product is Leaf Relief by Ply Gem. Yes, we do. We understand that replacing the gutters on your home is a major financial commitment. That’s why we offer zero percent financing for 12 months through GreenSky on projects ranging from $7,500 to $55,000. You can apply online, over the phone or have us apply for you during a free consultation. Learn more. We understand that your time is valuable, so we make purchasing new gutters as easy and time-efficient as possible. We’ll schedule your consultation for a time that’s convenient for you. Then our owner & founder, Kevin McCann, will come to your home and spend some time explaining gutter replacement and answering your questions. Then, all you need to do is decide when you’re ready to order your new gutters! Ask you to sign the contract and make the down payment. Send our ace team member Dave Ramseth to your house to confirm all of the necessary measurements. Call you to schedule the installation. On the scheduled day, our team of professional installers will arrive on time, and they will get to work replacing the gutters. In most cases, we can finish the job in one to two days. In all cases, we’ll leave your home and property as clean as or cleaner than when we arrived. We offer a 5-year warranty on the installation of the gutters. If you ever have a warranty question or concern, please contact us directly. 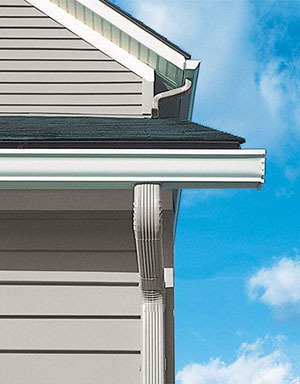 You can skip navigating warranty items with the gutter or downspout manufacturer. Let us do the legwork!